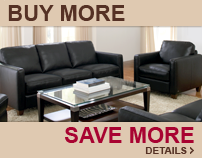 Natuzzi Editions offers terrific leather furniture at a great value--including some of our finest leather sofa beds. All Natuzzi Editions sleepers include a premium European webbed mechanism with a thick, foam-topped plush mattress. We offer Natuzzi Editions Special Orders, which take approximately 15-20 weeks for delivery--as well as a great selection of some of Natuzzi Editions's most popular styles in our Quick-Ship Gallery.